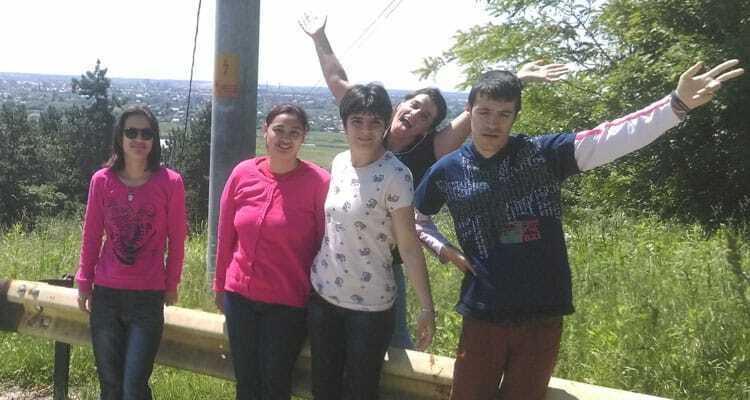 Once a month the young people from Nightingales are invited on a day out to Bucharest by a lady who runs a charity there. She prepares monthly trips for young people and children from various institutions and hospitals from the Bucharest region. Thursday 19th May was supposed to be another trip just like every month. Martha, the lady from Bucharest told us that we would be visiting 4 monasteries just outside of Bucharest and that we would have to be at the meeting place, McDonald’s at 8.00am rather than 8.30am. The start time from Cernavoda was 6am, the sky was bright and it looked like it was going to be a beautiful day. We loaded into the mini-bus still a little sleepy ready to head off for a fun day!!! Little did we realise that this ‘fun day’ would take in a round trip of Romania and we would return to Cernavoda over 15 hours later!! The first stop after McDonald’s was Targoviste, a beautiful town to the north west of Bucharest. The sun was shining and the grass around a local monastery was a true green colour. The young people loved walking around the grounds, chasing the odd cat and lying back relaxing on the grass. We were soon off to the next monastery, situated on a hill outside Targoviste, with amazing views over the town. It was after 1pm after we left here and the young people were a little hungry and tired and looked ready to go home! Luckily it was also Turkian’s birthday and she bought everyone some crisps and juice to keep the spirits up until lunch time. The next monastery we had hoped was on the way back home, but this was wishful thinking!!! The GPS pointed us in the direction of the next place, over in the county of Arges!! We arrived in Arges as the rain started to fall, and the young people’s stomachs were rumbling!!! The first monastery in Arges was also the lunch stop!! For us this was the last monastery. The young people ate as quickly as possible and we were in the van ready for a long drive home!! Almost five hours later we made it!! Now to the outsider this might not seem like a fun day, but it was great, the young people were happy to chat, talk about summer plans and look back on the good times we have had together over the last few years. Adriana obviously did a lot of bus dancing!! Elena enjoyed some coca-cola, Baba was giving the driver constant instructions of where to go and the girls from the apartment were on really good form!! Often the best times are the most unexpected ones, exactly like our trip around Romania!!! Nightingales Children's Project is based in Cernavoda and Constanta in the South East of Romania. It is run by a mixture of British and Romanian staff and relies heavily on volunteer input. Since its inception in 1995, the charity has evolved to encompass new projects and international developments and continues to be at the forefront of philanthropic work focused on the rights and opportunities of young people.